Some people make soup when they want to clean out their crisper drawer, I make salad rolls. I want to stress that unless you make salad rolls regularly in great quantity (a friend referred to his time working as a caterer and confessed that salad rolls still give him nightmares) they are a little bit tedious to make at any great speed or quantity, which is why I tend to make salad rolls when I can chat with friends or family on the phone or when I can approach the process with a zen-like quietness without feeling hurried. Although I occasionally use shredded chicken for protein in salad rolls my absolute favourite is the nuttiness of extra firm tofu, lightly poached and fork mashed with soy sauce and toasted sesame seeds. Essentially you are going for a layer of green, a layer of starch, a layer of protein, and a layer of crunchy vegetables; working within these parameters the possibilities and combinations are near endless and depend entirely on what your tastes are and what you have in your fridge. 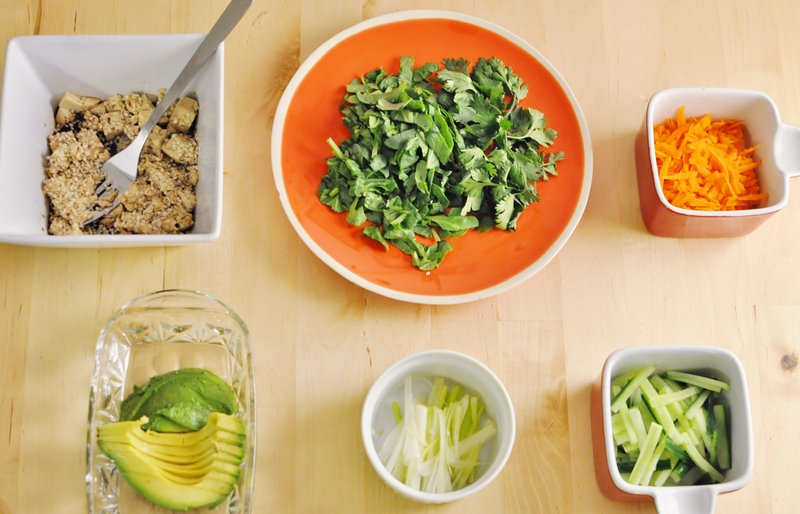 Assorted vegetables such as cucumber, scallions, sweet peppers, avocados, cabbage, and shredded carrots. 1. Have all of your salad roll fillings set out before you begin. In a shallow pie dish full of hot water soften the rice paper sheet by sheet, working as you go one sheet of rice paper at a time. 2. Lay the rice paper flat on a cutting board or mat and layer very small amounts of the bok choy greens, noodles, tofu, and assorted vegetables on the bottom third of the rice paper. Roll the paper up and away from you, tucking the ends in as though you were rolling up a tortilla, make sure the rice paper is sealed shut. 3. As you work, keep the salad rolls from drying out by sitting them on a slightly dampened tea towel, if making the salad rolls ahead of time tightly wrap the rolls in cling film and refrigerate. 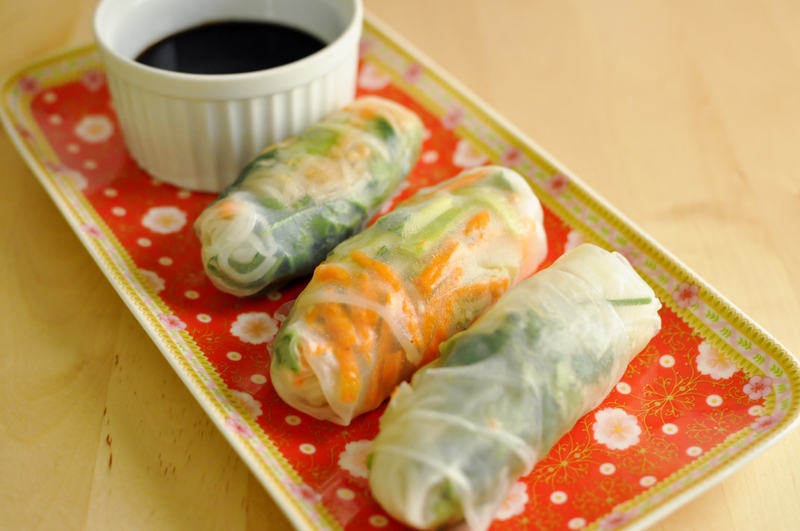 Serve the salad rolls with sweet and sour dipping sauce with the knowledge that your fridge has been thoroughly cleaned out. Whisk all ingredients together until thoroughly combined, serve with salad rolls. Badly Drawn Boy seems like a permanent fixture in my personal autumn landscape, I have so many memories of walking home from classes at night in university listening to this song – to the point that I can almost smell the frigid air and scattered skeletons of leaves that pad the sidewalks during late fall in Ontario. This song has always seemed witchy and mysterious to me, another tie in to the and indigo blue afternoons and darkening days of mid-November.